On a chilly Thanksgiving evening following turkey and too much food, we traveled to St. Francisville in search of an independent bookstore owned by Missy Couhig whom we had met when she represented the works of authors performing in a reading at the Festival of Words in Grand Coteau, Louisiana. The bookstore’s name, “The Conundrum,” remains a conundrum in the sense that the reason for naming this bookstore after a riddle patrons can’t figure out isn’t apparent to me. However, I did figure out, rather quickly, that I’d met a master marketer of books. Couhig, who’ll travel anywhere to sell books and meet new authors, says the word “market” isn’t really consonant with her mission. “The mission is about sharing,” she says of her profession. As director of three literary festivals, she touts authors in every discipline — fiction, poetry, children’s literature through three major events: The Walker Percy Weekend; Writers and Readers Symposium; and The Children’s Book Festival — all based in St. Francisville, Louisiana. Couhig retired from a position as executive manager of a pharmaceutical company, a job she had held for fifteen years before her husband, an attorney in New Orleans, came home one day and told her he had signed a lease on the building now housing The Conundrum (without her knowledge) in St. Francisville, Louisiana. He surprised her with the opportunity to pursue a profession as bookstore owner and manager — work for which she immediately showed a natural aptitude — and passion. Although Couhig first majored in English at LSUNO (Louisiana State University in New Orleans), she received a degree in General Studies because she says she didn’t want to spend five semesters in French classes required in the English curriculum. “I love to read but have no desire to write,” she added. Couhig arrived in St. Francisville on the heels of Hurricane Katrina when her husband, concerned about the safety of property belonging to his family, ended up buying a house in this small community of 1700 people. St. Francisville sits atop a ridge overlooking the Mississippi River and at one time provided the largest Mississippi River port between New Orleans and Memphis, Tennessee. Since the advent of the 21st century, the town has become a popular tourist destination for those who enjoy historic homes and southern culture. Couhig’s maiden name, Aleman, denotes German descent, and her great grandfather settled in Napoleonville, Louisiana on a Spanish land grant. She spends half her time in New Orleans where she and her husband have one home and the other half in St. Francisville where they own another -- that is, when she isn’t on the road, searching for new authors and bookstores. 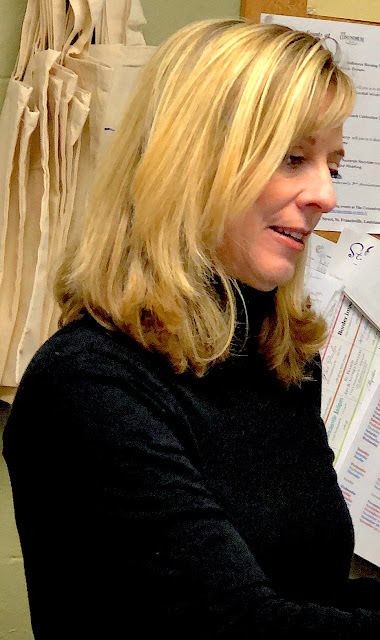 While talking with us, Couhig was busy inventorying shelves, opening shipments of books, serving other customers — doing some serious multi-tasking. And we could see why she wants to expand The Conundrum as she needs more space to house her plans for selling a wide range of new and used books, scheduling readings, directing festivals... and promoting books and authors she loves. On a recent exploration of Cajun country, while meandering not too far from the chenier plains of southwest Louisiana, we reached the Prairie Complex area near Leroy, Louisiana where signs directed us to Simon’s Citrus Farm. “Serendipity,” I said to Vickie, my travel companion. And it was serendipity indeed — seven acres of Satsuma trees among 25 acres of navel oranges, kumquats, grapefruit, lemon, and Louisiana Sweets as the Louisiana brand of oranges are called. And at the risk of fast becoming a Louisiana Agricultural Ambassador or a “foodie” via my blogs, I hasten to laud the quality of the Louisiana Satsuma Orange, Brown Select variety. 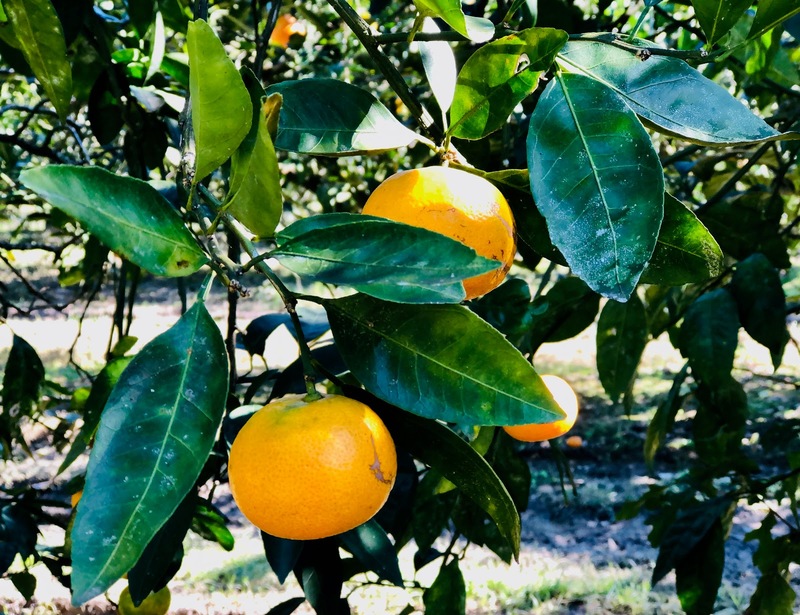 This delicious fruit is plentiful in the orchards of southwest Louisiana’s best-known citrus farm owned by Lynn Simon, a retired geologist and one-time owner of several oilfield operations. The farm is located near Kaplan, Louisiana on Gladu Rd., and Simon says unless a traveler Googles directions, knows where he’s going, or follows the signage, he’s not likely to come to his place for a visit. Simon Citrus Farm does have an informative website, with directions to the farm location where Simon explains that he began planting Satsumas in 1996 as a hobby, and the hobby burgeoned into a 1000-tree orchard. With the help of Dr. Brown, a specialist on the staff of the Louisiana State University Agriculture Center. he began growing the “Brown Select” Satsuma, the sweetest of all this fruit’s varieties. “Most of my clientele are Orientals,” he said. “A seedless, easy to peel orange is a favorite of the orange varieties, and we ship boxes everywhere.” He pointed to eight pallets holding boxes of Satsumas under a shed beside his offices. “I’m shipping these to Tennessee next week. We harvest every single piece of fruit by clipping,” he says, “which requires a lot of pickers, including restaurants and other businesses, as well as family.” Simon reported that freezes last January and February in Louisiana damaged some of the trees, but he usually produces 500 pounds per tree. “We market throughout the United States for retail, wholesale, and shipping clientele,” he added. The Satsuma fruit was reportedly growing in Japan over seven decades ago. In 1876 it was first introduced into Florida by George R. Hall, and in 1878, the fruit became popular in Louisiana. Simon reports that from 1908-1911, approximately one million “Owari” Satsuma trees were imported from Japan, and citrus farmers planted them in groves throughout the Gulf Coast states. By the 1890’s they had burgeoned into large-yielding crops. We noticed an old house next door to the Satsuma grove which seemed to be in the process of restoration and asked if we could tour it. 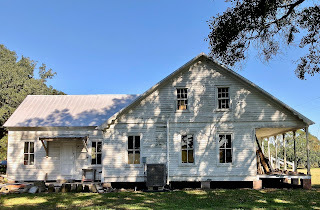 Simon eagerly agreed to allow us to do so, and we learned that it’s the oldest house in Vermilion Parish, Louisiana, dating back to 1865 when his great-grandfather lived in it. 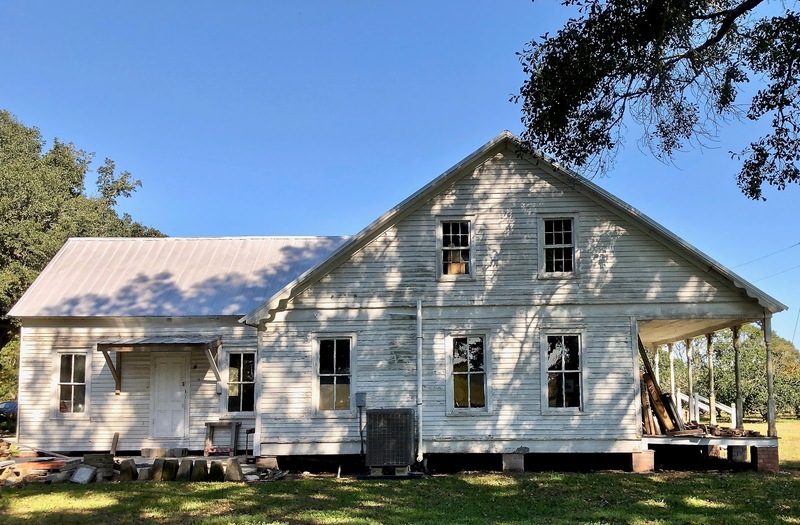 The house, built entirely with pegs, square nails, cypress walls and floors, is being restored to provide a bed-and-breakfast facility, and Simon and his wife are working on the restoration themselves. A talented and industrious couple, they also restore and build furniture that will decorate the old house. The visit that lasted for an hour with this engaging “retiree” provided us with two serendipitous tours, and we came away with a sack of Satsumas that are the sweetest Louisiana fruit I’ve yet tasted. October and November are prime months for these quality Satsumas, and we were happy to discover that they’re high in antioxidants and Vitamin C — just in time to ward off the winter flu season. During the month of November every year, for at least 20 years, I initiated a hunt for fig preserves made here in Louisiana to send to my youngest daughter, Elizabeth, in southern California—not smushed ones sold commercially in a grocery, but whole ones with the stem still on the fruit and steeped in lots of sugar like Elizabeth’s grandmother once served up on hot, buttered biscuits. For years, I talked to many food faddists in New Iberia, Louisiana who knew where I could find this homemade preserved fruit but they wouldn’t divulge the source (xenophobia at its worst)!! However…last year when we went to purchase grass-fed beef at GLC Meat Market in Loreauville, Louisiana, voila! I discovered an entire table of fig preserves, stems included, swimming in syrup, in Mason jars with gold tin lids. I saw more of the same product just last month, and I'm assured Elizabeth's Christmas gift is available. When I first spied those preserves in GLC, I became as excited as I had been when I found a bottle of McIlhenny’s Tabasco sauce on the table of a small supermarket in Ahwaz, Iran where I lived in the oil patch for two years. “Hey la bas, hot sauce,” I exclaimed, startling a few shoppers clad in chadors who already thought Americans too boisterous. I couldn’t contain my joy when I saw those little red-capped bottles of sauce because I was in a three-months cultural shock phase and homesick for Teche country. At the time of this outburst, I envisioned a large black pot similar to the one owned by Big Mac in New Iberia, Louisiana, 100 lbs. of crawfish, a case of McIlhenny’s Tabasco, some strands of Spanish Moss waving in the hot desert breeze, and a crowd of expatriates gathered for a crawfish boil in my front yard. I left the supermarket with a half dozen bottles of the sauce and displayed one of them on the dining table for dinner guests to view for the entire two years we spent in Iran. It was a good conversation piece. I digress. My daughter Elizabeth could probably find fresh figs in California, but she hasn't located a source for fig preserves. I doubt if she knows how rich in minerals and anti-oxidants they are, as her sweet tooth usually takes precedence over foods that I’ve told her are good for her, so she’s getting nutrition without my having to counsel her about diet. She also doesn’t know that Buddha achieved enlightenment while sitting under a fig tree or that the fig tree was the first fruit tree mentioned in the Bible. According to Francoise Mignon,* one of my favorite Louisiana authors, fresh figs taste better with a “dab of sugar and a spot of cream,” but he also admitted that he could possibly “respond to the sweetness of the preserved variety …as it would carry with it a nostalgic reminder of the foregoing July when the gathering of the product was in full swing and figs for breakfast, dinner and supper were the order of the day…” He writes about the Ficus carica in Plantation Memo: Plantation Life in Louisiana, 1750-1970 And Other Matter. 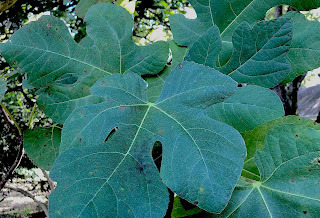 Mignon mentioned that fig leaves have “served as models for more sculptors working in marble than any other device for de-sexing statues all over the Western world…” He was also amazed that Eve would have chosen the fig leaf to create clothes for herself and Adam since it has such a fuzzy, prickly texture. I might add to this comment that the smoother leaf of an elephant ear plant would have been a better sartorial selection as this large plant leaf wouldn’t have driven her to find thread and needle to create covering for the couple’s private parts. P.S. And just as a piece of trivia, in case readers have warts, fig juice is supposed to remove these unsightly skin eruptions. I don’t know how many Cajun traiteurs still use this remedy in their practices. *Francois Mignon, the author of Plantation Memo, published his columns first in the Natchitoches Enterprise and in The Natchitoches Times; later, the columns appeared in The Leesville Leader, The Shreveport Journal, Alexandria Town Talk, Opelousas Daily World, and The Shreveport Times from 1957-1970. 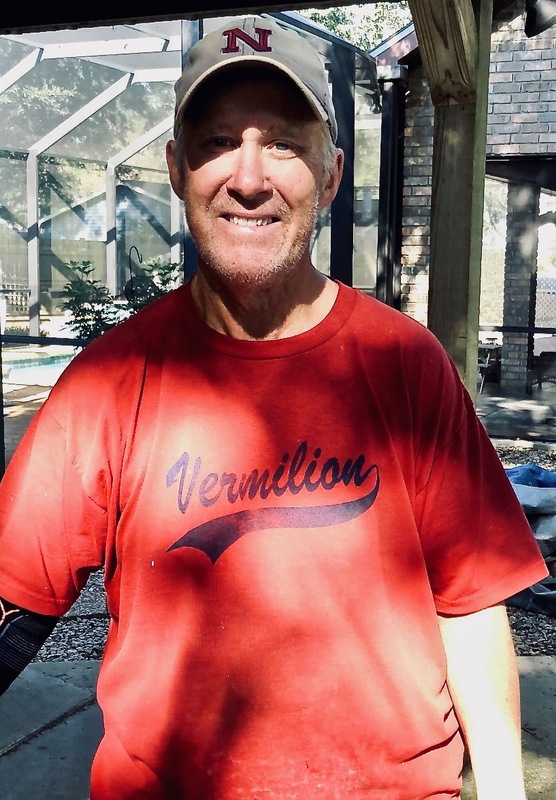 He was the famous house guest at Melrose Plantation in Robeline, Louisiana who was invited to visit Cammie Henry, mistress of Melrose, and stayed in Yucca House on the grounds of Melrose for over thirty years! I’ve been considering writing a non-fiction book about him. His columns about Melrose are outstanding. Six years ago, I walked into the offices of the Cane River Pecan Company here in New Iberia, Louisiana and was surprised to see, on one wall, a framed copy of a 34-year old article in the Daily Iberian entitled “Pecan Businessmen Beginning Young” with my byline. After I talked with Jady Regard about the framed article, I blogged about the Company, acknowledging the Dan Regard family for its phenomenal progress with a small enterprise manned by three forward-looking brothers who established a home-based pecan-cracking business called “The Nutcrackers" that mushroomed into a thriving business selling pecans as far afield as Singapore. The Cane River Pecan Company features a product line that includes roasted and salted pecans, chocolate-covered and praline pecans, fresh-baked pecan/chocolate chunk cookies, pecan pralines, pecan praline popcorn — and, now, a dessert that CEO Jady Regard has concocted for the “Company Special”—Boudin Pie! Jady Regard is one of New Iberia Louisiana’s entrepreneurs who gave up a job as manager of corporate sales for the Chicago Bears and for the LSU Basketball team to take over marketing products of the Cane River Pecan Company. 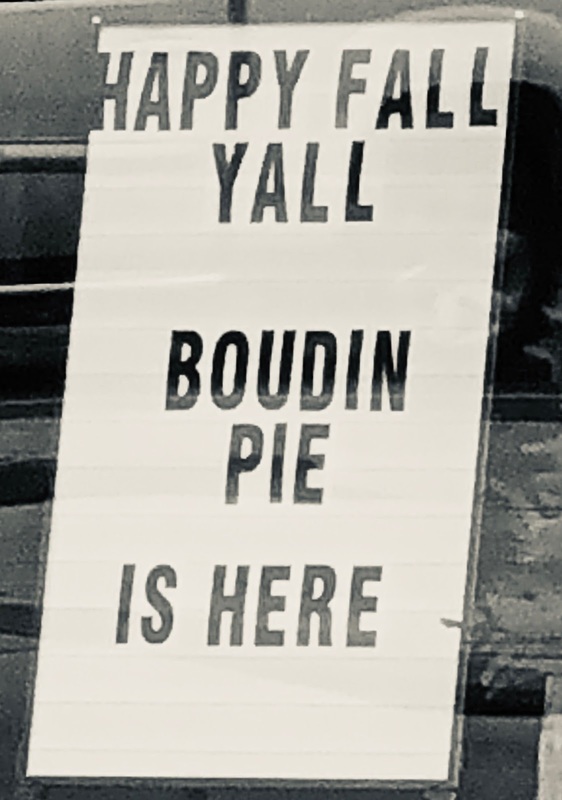 His newest concoction, Boudin Pie, contains one pound of locally sourced, uncased pork boudin, a layer of sweet potato souffle covered with a pecan glaze in a handmade deep-dish crust. Boudin and pecan glaze? I’m told that it’s a dessert infusion that bests all homemade Cajun dishes. I haven’t tasted this dish yet, but I visited the new headquarters of Cane River Pecan Company on Main Street two days before their scheduled tasting event. I walked around looking at products the company offers and admired the murals of the Natchitoches plantation area on one wall of the showroom — pictures and timelines concerning the pecan growing business. By adding pictures to this wall, Regard hopes to form a museum that will educate visitors about the industry, as well as advertise Louisiana’s rich resources. The Cane River Pecan Company was sourced by Jady Regard’s father, Dan Regard (now deceased), who owned a pecan grove on the plantation “Alcock Place” in Natchitoches, Louisiana. He employed his sons to spend their after-school hours and holidays cracking up to 400 pounds of pecans a week, using a large nut-cracking machine he ordered from San Antonio, Texas. Jady and his brothers sold pecans from a shop adjoining the Regard home on Darby Lane and advertised their product on signs placed in store windows of New Iberia and in the local newspaper, The Daily Iberian. From that small beginning, with their parent’s backing, and, later, with Jady’s talent for marketing, The Cane River Pecan Company burgeoned into a worldwide product distributer now equal to other Teche Country products such as hot sauce and rice. Colorful tins with lids featuring paintings by Louisiana artist Clementine Hunter and, now, lids of tins with pictures of New Orleans streetcars, contain the company's pecan products and line the shelves of the new showroom. In addition, corporations can order custom gift tins of pecan products that show their own logos and personal messages. 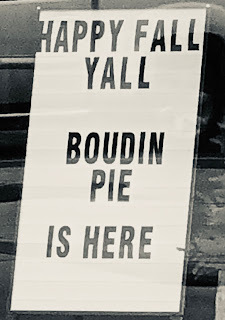 Mais, when the weather clears — if the weather clears — I’m going downtown and get my satisfied from a boudin pie so I can brag about it to my Sewanee, Tennessee friends who often wonder what Cajuns will eat next! Border Press Books, Sewanee, TN, announces the publication of All Love, by Diane Marquart Moore, a volume of poems about relatives and relationships, death and dying, illness and recovery, and includes a special section about a three-week sojourn in Mexico. Also featured are prose poems and excerpts from “Everyday Journal IV” about ordinary and extraordinary daily happenings, as well as observations about present-day social issues. Diane Marquart Moore is a retired archdeacon of the Episcopal Diocese of Western Louisiana, poet, writer, and journalist who lives part of the year in New Iberia, Louisiana, and part of the year in Sewanee, Tennessee. She publishes “A Words Worth” blog at revmoore.blogspot monthly. The beautiful cover photograph is Karen Bourque’s glass adaptation of a lotus appearing in Why Water Plants Don’t Drown as illustrated by Susan Entsminger and authored by Victoria I. Sullivan. Cover design of All Love, by Martin Romero. All Love, as well as 49 other titles by Moore, are available through Border Press Books, P.O. Box 3124, Sewanee, TN and amazon.com. In this time of anxiety and darkness in our broken world, we can count on Paul Schexnayder, New Iberia, Louisiana artist, to gift us with his playful illustrations that always lift our spirits. In The Time of Shimmer and Light, the second book in a three-part series just released by University of Louisiana at Lafayette Press, will delight both young and adult readers. The story takes us to the happy island home of Sir Galatoire Gator, Tin Toy Hare and Queen Ida Peacock where the three critters vie for a dazzling doodad the Queen has found bobbing up and down on the water near their island home. 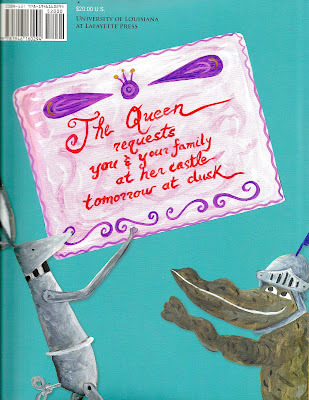 Schexnayder’s vivid acrylic paintings mesmerize readers, glowing with imaginative figures that “bumble, mumble, and grumble” until the Queen shows her critter friends the object she has discovered and placed in a brilliant red boat to dispel the disharmony developing amongst the friends. I won’t reveal the object or the end of the imaginative fable Schexnayder has created, but readers won’t be disappointed to find more serendipity in the work he offers. A visit to Schexnayder’s gallery is an occasion of “joy and wonder, shimmer and light,” and visitors usually come away with an art object in hand. Lately, a visit reveals paintings of moss-covered kings who people one wall. The paintings depict mystical-looking beings who are a departure from his “Girth Series,” those kings with tiny heads and billowing robes that he initiated in 2016. “It takes awhile for patrons to get used to a new series,” Schexnayder explains. However, I've found favorable reviews of the new work on facebook and know that his followers will soon add them to their Schexnayder home galleries. Schexnayder, who always discovers treasures to paint, has made memorable a simple red rowboat that provokes thoughts of optimism, and the word “joy” is frequently reflected in his books, as well as in his art. The mysterious factor in his paintings is that he’s color blind; however, his purples, reds, yellows, and blues leap from the walls and pages of his work after their birth in the colors of his imagination. This notable New Iberia artist has created illustrations for at least three of my own books, and I often re-use them in blogs. The whimsy that Schexnayder conveys is infectious and his mission, a simple one — to recreate the Fruits of the Spirit, specially the one at the top of St. Paul’s List — JOY. His creations also emerge as acts of love, another outpouring of the Spirit. Paul Schexnayder has a Bachelor of Fine Arts degree from Louisiana State University, has worked as an art teacher, serves as a member of the Society of Children’s Book Writers and Illustrators and owns an art gallery in New Iberia that he generously shares with regional artists and writers. Recently, he painted a mural depicting his “Girth Series” for the City of New Iberia. The mural emphasizes the idea that New Iberia is not only the “Queen City of the Teche”, as it is often called, it’s also the King City of Bayou Country. Bravo, Paul, thank you for spreading joy and wonder, shimmer and light! Friday evening, we traveled to St. Landry Parish to hear readings by three writers featured in the 11th Annual Festival of Words and were entertained for two hours by Jack Bedell, Louisiana Poet Laureate; Cornelius Eady, a musical theatre poet; and novelist Ladee Hubbard. The trio held creative writing workshops and drive-by poetry readings on Friday and Saturday, November 2nd and 3rd, but I was only present for the Friday reading at Chicory’s Coffee and Cafe in Grand Coteau, Louisiana. We usually migrate from Sewanee, Tennessee to home in New Iberia, Louisiana just in time to attend the Festival, and I’m always amazed at the literary stars that Patrice Melnick, Director of the Festival, attracts. The Festival of Words is supported by a galaxy of arts organizations: the Louisiana Division of the Arts, Office of Cultural Development, Department of Culture, Recreation and Tourist in cooperation with the Louisiana State Arts Council as administered by the Acadiana Center for the Arts, and partners with the Acadiana Writing Project, Grand Coteau Cultural Arts Foundation, the Thensted Center, Nunu’s Arts and Culture Collective, Lyrically Inclined, Chicory’s, Giles Automart, St. Landry Parish Tourism and Arts and Writing supporters from throughout the U.S. The three presenters enjoyed equal time as writers from diverse backgrounds, but “A Words Worth” can only accommodate showcasing one from the trio, and I decided to create press for the Louisiana Poet Laureate, Jack Bedell. He’s an engaging poet who teaches English at Southeastern Louisiana University where he edits Louisiana Literature and is director of the Louisiana Literature Press. I was impressed by Bedell’s humility and what he calls his “simple lines” (from his inscription in No Brother, This Storm, the book I bought during break time at Chicory’s). An unassuming person, he was dressed casually, wore a baseball cap while he read, and delivered poems that reflected a devotion to family, capturing the audience with lyrics of grace and simplicity. check each slat in the storm shutters. and wait for her, each one a prince. The eloquence in the last two lines evokes the image of an admiring father observing his daughter at play — a nurturing father portrayed in a powerful psalm. A childhood memory of learning “The Children’s Hour” by Longfellow in the third grade flashed through my mind and formed a cameo of the loving father surrounded by his adoring daughters. I was drawn to all of Bedell’s poems about his daughter, and having written about a turtle yesterday, I revisited the following poem he presented at the Festival reading. These tender, soft-voiced lines resonated with me. to position it with more grace. song to hold all of this, enlaced. Bedell will present his work at the upcoming Louisiana Book Festival next weekend in Baton Rouge, and those who will participate and hear him for the first time can look forward to a time blessed with a wise and delightful reading from our state’s most hopeful poetic voice. Yesterday, while riding along Hwy. 182 en route to New Iberia from Broussard, Louisiana, we whizzed past a ditch filled with water where a police car was parked. The police officer seemed to be arguing with a man holding a rope to which a turtle was tied. I only caught a glimpse of the turtle but could see the spiked shell and thick scaled tail of a huge alligator turtle. If I had satisfied my curiosity, I’d have asked the driver to stop, but thought I might get embroiled in some kind of endangered species argument. I’ve read that alligator turtles aren’t labeled as “endangered” in Louisiana right now, but they are over harvested for their meat. For all I know, the man holding the rope could have just caught his supper and was being chastised for fishing in a highway ditch. I’ve been interested in these primitive-looking turtles since I read that they were plentiful on Last Island during the 19th century and that their weight was reported to top 200-400 pounds. They also lived to be 50-100 years old. 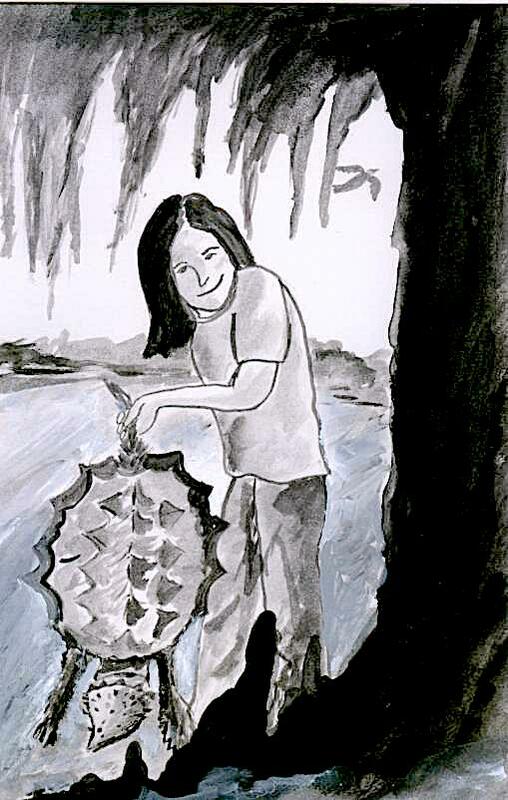 Several years ago, when I was writing The Kajun Kween, a young adult book, the alligator turtle became a challenge for Petite Marie Melancon, the heroine of a comic strip who caught one in a hoop net, and New Iberia’s famous local illustrator, Paul Schexnayder, painted a picture of her holding the critter by its tail. Alligator turtles hardly ever come on land, except when the females want to lay their eggs, and November is the wrong season for egg laying, so I’m wondering why the turtle I saw ventured into a roadside ditch, unless the world was “too much with [her]” and she was near the 100-year old mark. After all, some hardy alligator turtles live to be several hundred years old, especially in southwest Louisiana. According to Petite Marie, who read extensively before going on an adventure to catch an alligator turtle, in the 1800’s, a man named James Cathcart was sent to Last Island, Louisiana to survey timber suitable for making U.S. vessels, and he found fishermen catching 300-lb. turtles at the rate of five alligator turtles a day. They were selling them for $7 apiece and kept them in pens until buyers showed up. Petite Marie figured she’d be lucky if she caught a 50 pounder. However, she managed to net a huge one, and her fishing companions severed its head, placed it in a bucket of water, stuck a twig in its mouth, and the head clamped down on the twig. Petite tells us that the movement of the head was only a reflex but it must have been a frightening sight. Of course, this is only a replay of a fictional account, but as we zoomed past the snapping turtle on a rope, I admit to being spooked enough not to turn my head for a backward glance. My mother often made turtle soup for her family of five children, but I think the turtle was probably a soft shell turtle my intrepid father had caught in the Bogue Chitto River and beheaded before he brought it home sans head for my mother to cook. Today is All Saints Day, and, in honor of those who’ve inspired our faith we recognize both ancient and recent family saints. I could probably drum up a list of women who have led me, intentionally and otherwise, into religious inquiry and active church work, but the most notable ones were two who were included in my second book entitled Their Adventurous Will: Profiles of Memorable Louisiana Women. Those profiles deserve a revisit today. 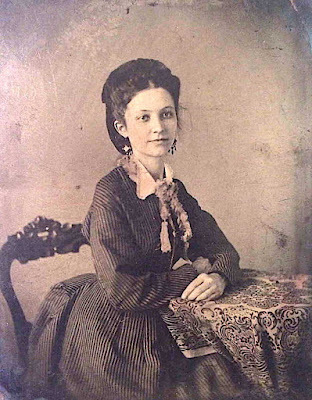 “My great-grandmother, Dora Runnels Greenlaw, who died the night I was born and executed a literary and religious transfer to me (according to family members), was also a visionary who felt her life purpose to be that of a missionary and who spread the Gospel from a horse-drawn buggy of the kind used to transport country doctors to their house calls. Like the American poetess, Emily Dickinson, Dora Runnels was semi-reclusive, spending days writing verse in a back room of the old Greenlaw home in Franklinton and mysteriously appearing in the afternoons to venture forth on her missionary calls. 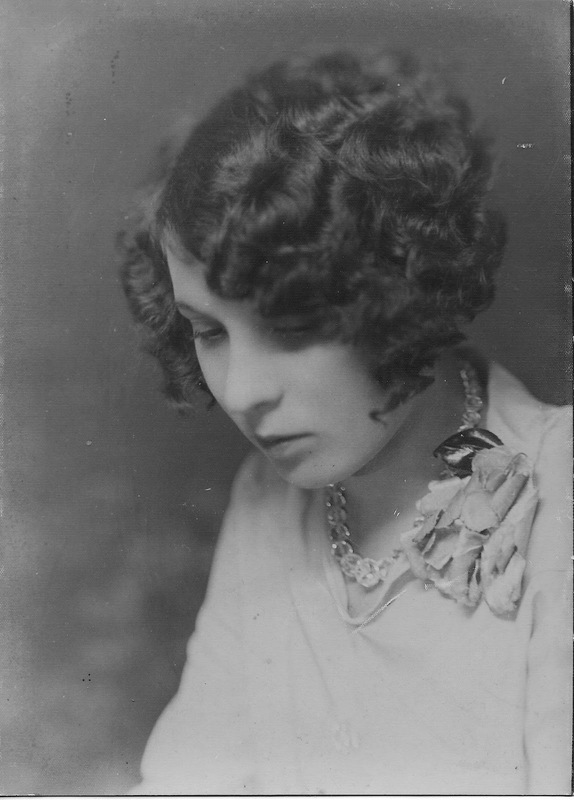 The record of her talents can be found in a few pamphlets of verse which her son Edward published on a small printing press he owned and in a booklet which I discovered in the Louisiana Room of the Louisiana State Library entitled Memoirs of the Baptist Women’s Missionary Union of Washington Parish Association, published in the early 1900’s.